The Leiden Weaver House Museum, the Netherlands (solo exhibition); Regent Room, The Hague, the Netherlands (solo exhibition); City Hall, Rotterdam, the Netherlands; Bank of the Republic of Colombia, Medellin, Colombia (solo exhibition); Somjai Reiss Gallery, Bangkok, Thailand (solo exhibition); Torpedo Factory Art Center, Alexandria, Virginia (solo exhibition); Museum 25th May, Belgrade, Serbia; World Art Center, Delft, the Netherlands; Burnie Regional Art Gallery, Tasmania Australia; Buenos Aires, Argentina (5th International Biennial of Textile Art); Wasser I Zeichen, Bremen, Germany; Paper Museum, Capellades, Spain; Beverly Art Gallery, Yorkshire, England; Piece Hall, Halifax, England; Collins Gallery, Glasgow, England; Museum Rijswijk, Den Haag and CODA Museum, Apeldoorn, the Netherlands (Holland Paper Biennial); Kaye College, Art Gallery, Beersheba, Israel; Austrian Paper Museum, Steyermuehl, Austria; The City Museum, Deggendorf, Germany (Paper Road, traveling exhibition); Museum of Papermaking, Duszniki, Poland; Charmey Museum, Switzerland (6th Triennial of Paper; award recipient). Textile and writing have been my source of inspiration: textile as the underlying structure of things, and writing as a textile created by the continuous interlacing of words. 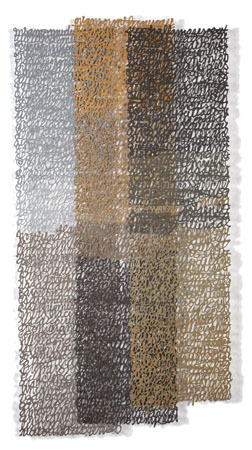 Much of my work focuses on visual texts where words, rather than written on paper, are made ? ?of paper, as see-through structures made up of lines in space, allowing light to filter through and shadows to emerge. 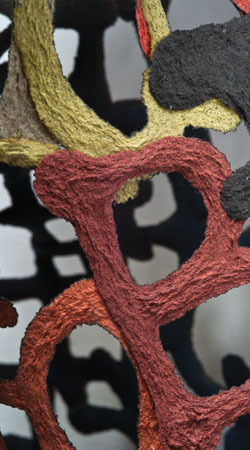 These structures derive from handmade paper techniques. Using damp paper pulp I draw figures on a fine mesh, stretched taut on a frame. As the pulp dries the drawings can be peeled off from the mesh.